As most of you know, Denis and I spent the last two weeks of September in the UK-- first on a beach in the remote northwest corner of Scotland, then in Durham, and finally in London. It was a trip of many firsts. First direct flight to the UK. First time traveling on trains. First time in a cottage with no dryer. First time in London. That list will do for now. It was an exhausting trip, a trip laced with pain, and a trip filled with friendship and absolutely wonderful experiences. I would not have missed it for the world. Now it's time to begin sharing our journey with all of you in both words and photographs. I hope you enjoy all the chapters to come. Denis and I are pretty much fed up with air travel. Between the ill-tempered antics of too many TSA employees to the airlines' insistence on treating us like cattle unless we take out a second mortgage on our homes, it's just not fun anymore. We try to make it as easy on ourselves as possible. Instead of dealing with long-term parking or a shuttle to get us to the airport, Denis makes a reservation with ExecuCar. For just a bit more money, we get personal service from door to door. This time the driver didn't have much to put in the trunk of the car. We were traveling lighter than normal: two 22-inch rolling duffles that we checked in, one rolling laptop bag, a backpack, and Denis's CPAP machine. One thing I can say about Sky Harbor's TSA employees is that they are much nicer than those in any of the other airports we've gone through. Yes, it is possible to be civil and do your job properly! Unfortunately, once again I was pulled aside to be patted down. You know, it isn't "random" when you get pulled out of line and patted down every single time you go through airport security! 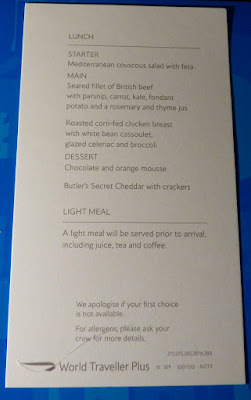 Denis and I can never sleep on airplanes, so we were pretty lagged when our ten-hour flight to London's Heathrow arrived. We couldn't believe what happened next. First we had to go down three flights of escalators, board a train that moved so fast and so abruptly that you had to hang on for dear life, then go back up three flights of escalators in order to be crammed into cattle shutes to have our passports stamped. By the time we got through that mess and got our bags, our driver had almost given us up for lost. 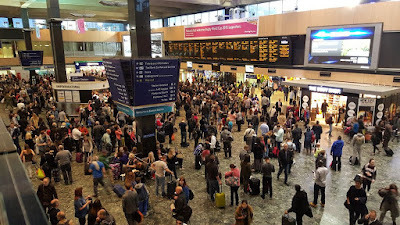 Euston Train Station-- and it's not rush hour! I was in London for the first time in my life. As the car wove in and out of traffic through the heart of the city, I tried to see as much as possible. So much so that I almost gave myself whiplash. 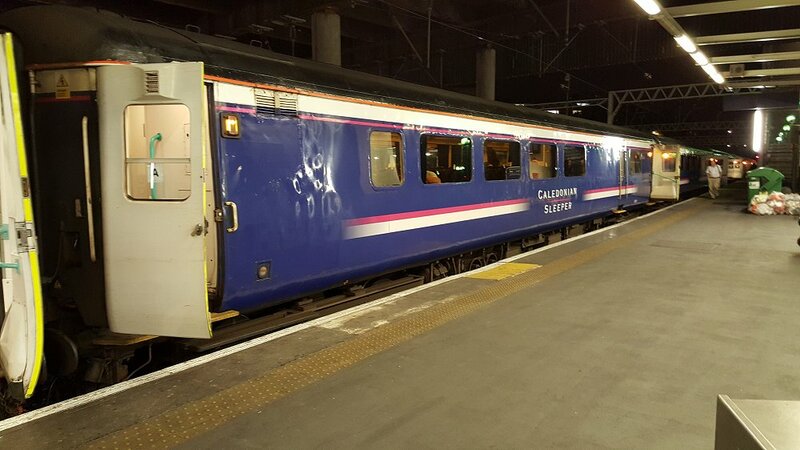 Dropped off at Euston Station where we were to board our train, a lovely young man saw us reeling and weary, loaded our bags on his cart, helped us climb aboard, and took us to the first class lounge, where we had a good three hours to wait for the Caledonian Sleeper. 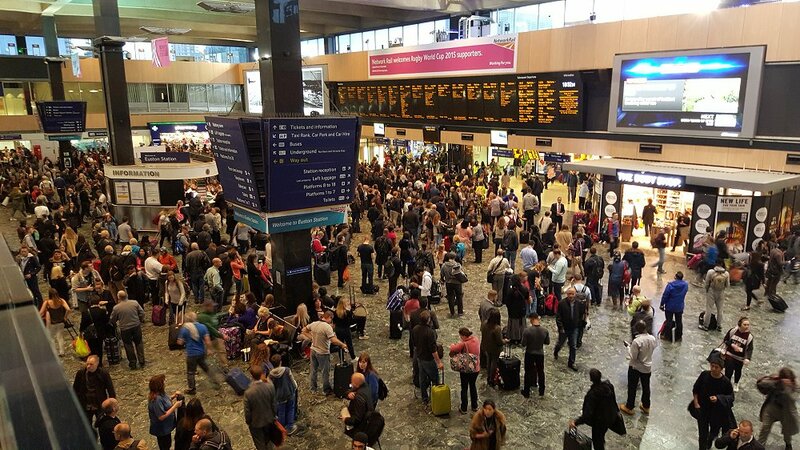 Thank heavens we didn't have to try to make it through the masses of people that were there during rush hour! As it was, the second the platform number was announced, there was a stampede for the train. A pretty young thing with stylish blond locks, designer clothes, and high-heeled boots thought she would get between Denis and me on her quest for a shortcut to the train-- at the expense of running over my toes no less, but one of my Looks dissuaded her. Naturally our berth was practically at the end of the train. At this point, all we wanted was to fall facedown in our berths and get some sleep. As we staggered to our destination, the Caledonian employee who had just started helping another couple took one look at us and immediately switched our berth with the one assigned to the other couple. We had a berth at the end of the car right next to the bathroom. Thank heavens! I didn't have the energy to crabwalk me and my bags down a narrow aisle to a berth, and if I could, I'd give that woman a big raise and a huge Christmas bonus for her quick and compassionate thinking! 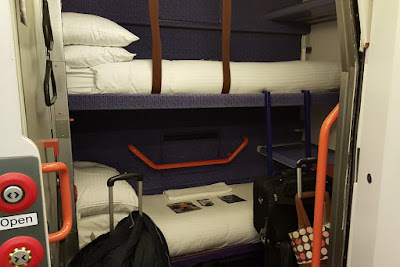 As you can see, once we got our bags in our berth, the only spots for us were the bunks. After warning Denis not to get up in the middle of the night and wander down to the end of the train-- because he'd wind up in Fort William, not Inverness-- and delivering tea and water, the woman left us alone. In a matter of minutes, we were in our jammies and in our berths. But I couldn't sleep. I was too excited. Having grown up a half block from the railroad tracks, I've always found the sounds of a train moving along the tracks to be soothing, and the slight swaying of the car was comforting, too. But sleep would only come in brief catnaps. So I found myself looking through the freebies that were thoughtfully provided. A magazine, and a little pack containing soap, earplugs, and an eye shade. 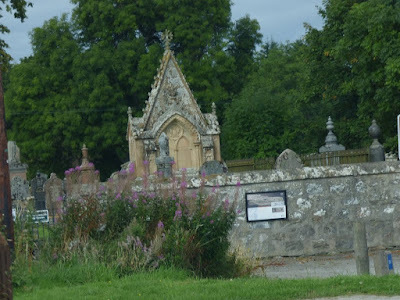 I also thought about what one of the employees had told Denis-- that people like the Laird of Dunvegan Castle and other titled rich folks preferred to take the overnight sleeper because the amount of luggage you have isn't restricted. Hmm. What do they do? 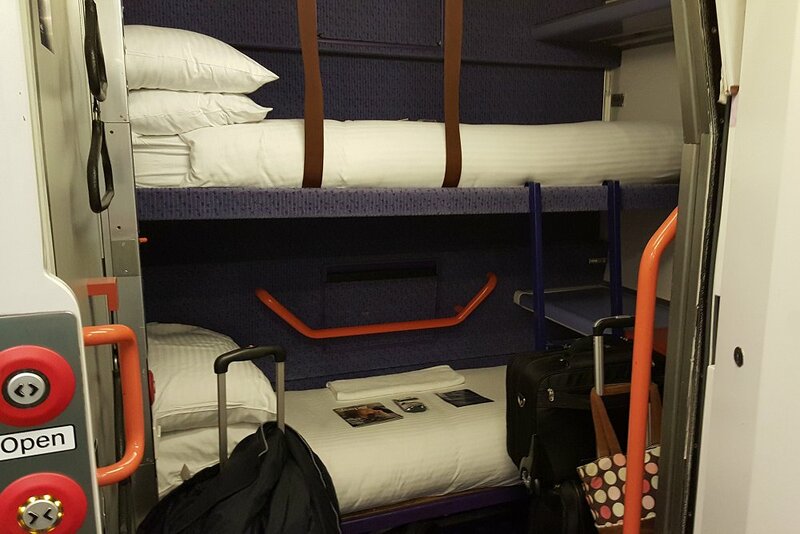 Pay for two berths and load one down with all their shopping? Thinking of that and watching bright lights periodically flash past the window made me nod off for a few minutes. 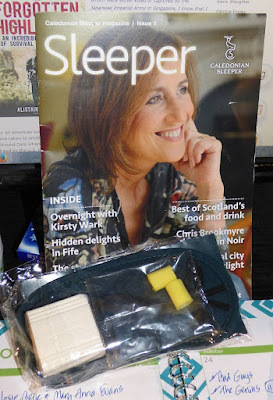 The crime fiction lover in me was pleased to see a write-up about "Tartan Noir" in the Caledonian's Sleeper magazine. 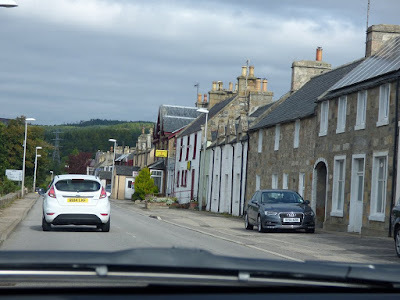 By the time the train arrived in Inverness, we were on the very last car, the others being uncoupled at their destinations along the way. Of course, since we were at the end of the train, we had an extra long walk into the train station, and by that time-- with jet lag and basically missing two nights' sleep, we were both the walking dead. The rental car company came to pick us up and take us on a short drive to their place of business. Denis signed the paperwork, we loaded the car, drove to a nearby Morrison's supermarket, bought groceries-- where we had to pay for our grocery bags-- and were on our way. It was one hundred plus miles to our beach bothy outside of Durness. For some reason, I've never had trouble getting in the proper side of the car in the UK. It probably has something to do with the fact that Denis told me if I ever did, I would find myself driving. Funny the things that stick in your mind, isn't it? An old cemetery in Kincardine caught my eye as we drove by. With all that bright orange, I saw the Bridge Hotel long before we got to Bonar Bridge. 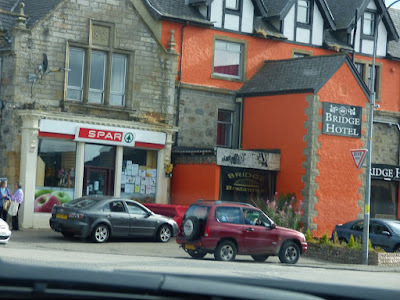 The little building to the left-- the SPAR-- is like the American 7-Eleven without the gas pumps. 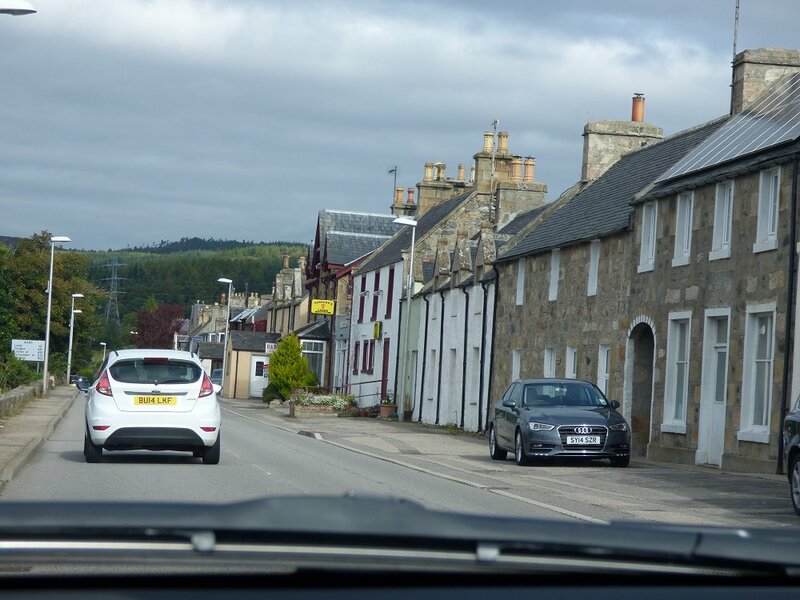 Here's one of the main streets in Bonar Bridge as we drove through. 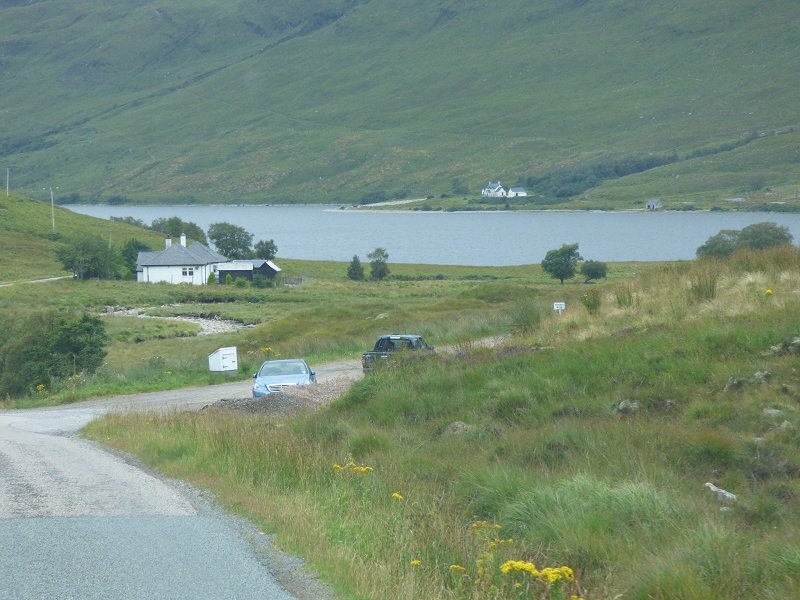 Shortly afterwards we were on the fifty miles of single track road that would take us to Durness. Single track road? That means a one-lane road. 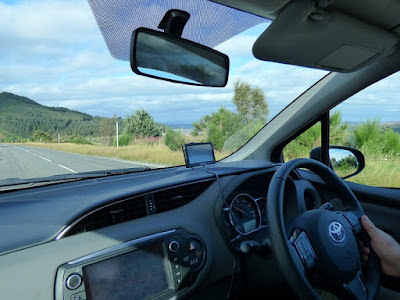 All the major roads in the part of Sutherland that we were traveling to are single track. That's how remote it is. Average population density there is one person per square mile. 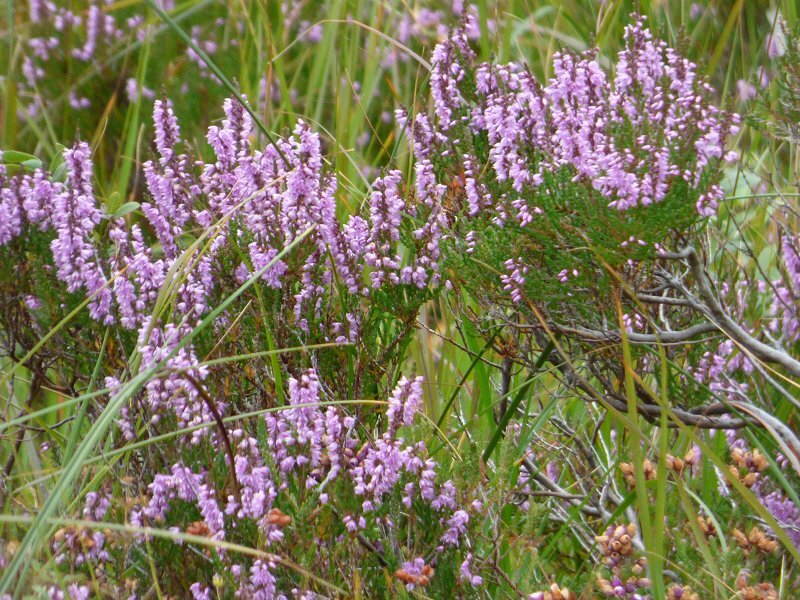 By this time I was beginning to see entire hillsides covered in heather. It was well past its best, but was certainly still pretty enough to make me want to see it at the height of its bloom! Every time I come to the Highlands, I know I'm home. It's impossible to describe how I feel when I'm here. We were two very thankful people when we drove through Durness (population 200 or thereabouts) and turned into the lane that took us past Balnakeil House and on to the beach bothy. 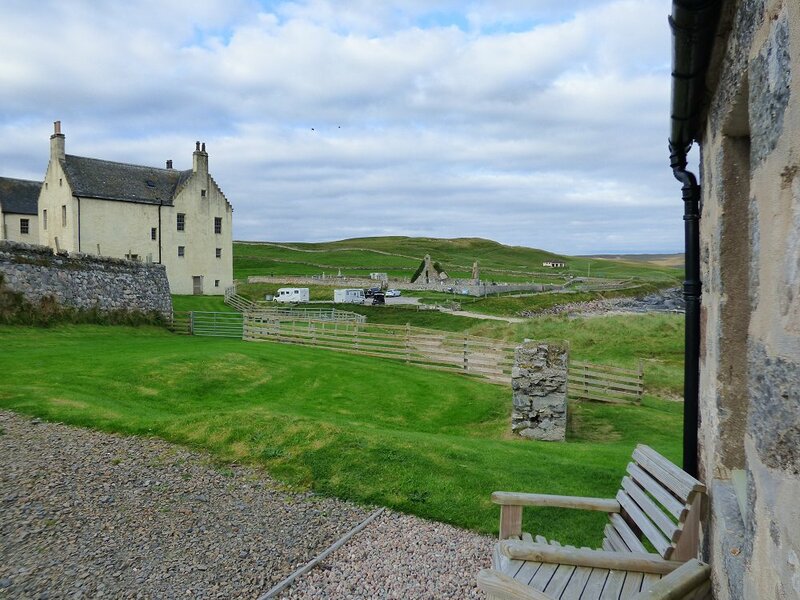 The building of the original Balnakeil House began in 1642, and it's available for rent, too. it was our neighbor on the other side of that dry-stack stone wall. The vehicles you can see in the distance are in a small parking area for people who like to come to walk Balnakeil Beach and to visit the ancient church and graveyard. Well back in the distance is another building, which is the club house for the local golf course. From what I understand, one of the holes on the course requires golfers to hit the ball across the sea. Good luck on that shot! 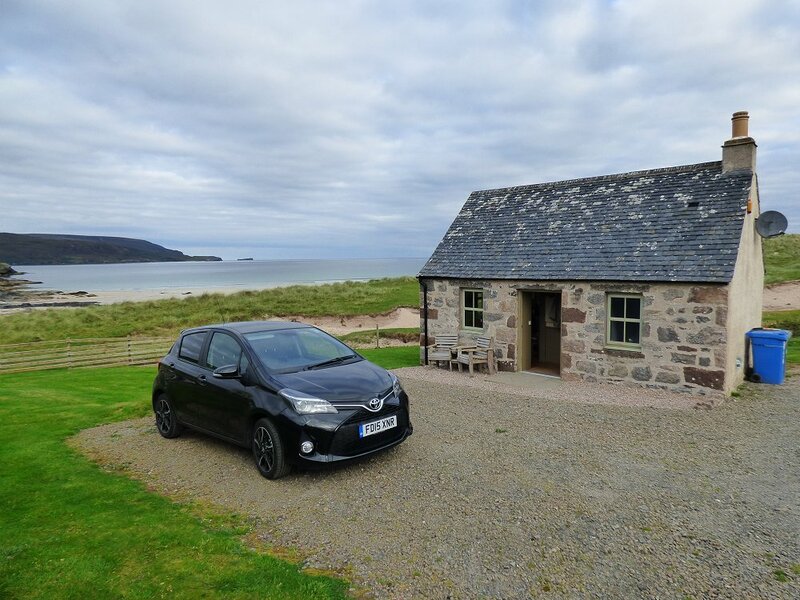 And here is the Balnakeil Beach Bothy-- our wee home away from home for a week-- with the beach right behind and our rented Toyota Yaris parked in front. 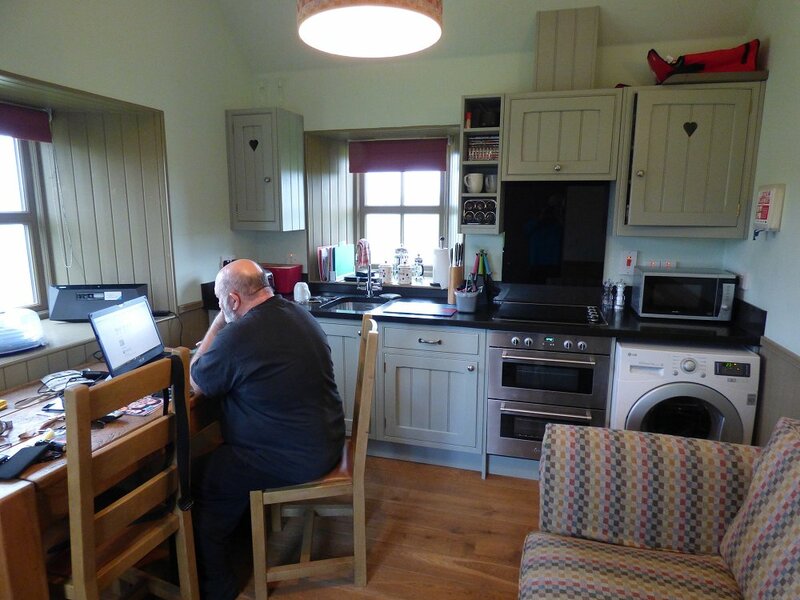 The bothy was completely derelict, but after applying for and receiving planning permission, it was rebuilt and provides snug accommodation for no more than two people. And when I say "wee", I mean tiny. Once I had our bags unpacked, the empty luggage had to be put in the boot...er... trunk of the car. There was no other place for it. The stone walls are two feet thick. We were as snug as two bugs in a rug, and those walls were a blessing for two reasons. One, we never knew when storms were raging outside unless the wind was blowing the rain directly on the window glass (or if we looked out said windows), and two, those deep windowsills were badly needed storage areas. 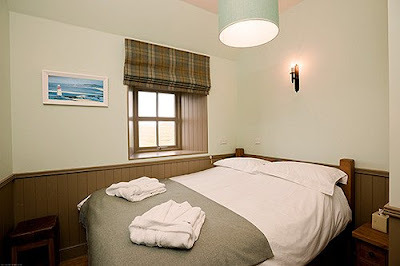 This photo of the bedroom is from the website. By the time we got some desperately needed sleep and I was up and about taking photographs, we'd junked up the bedroom to the point where I didn't want any of you to see it! Denis used the windowsill for his CPAP machine and for his electronics charging station. While I went computer- and internet-free for our entire holiday, Denis did not. In the corner at the foot of the bed where you see a small stool, there is now a tall narrow chest of drawers, and immediately to the right of the doorway are pegs and a few hangers for any clothing that needs to be hung. This is most definitely not the place for people who are clothes horses or incapable of packing light. I'd done my homework, so it wasn't a problem for us. In fact-- as light as I'd packed-- we still wound up bringing things we could have left at home (and not had to lug around from one end of the UK to the other). There's not much you can say about a bathroom. 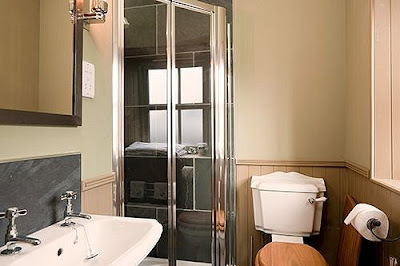 The bathroom at the bothy (photo from the website) was tiny but served its function well. In fact, I was extremely impressed with how well designed and furnished the entire bothy was. Now on to the main living space! I stood in the tiny vestibule to take this photo. Our first day in the bothy, we had a very lazy day because we were completely exhausted from our travels. 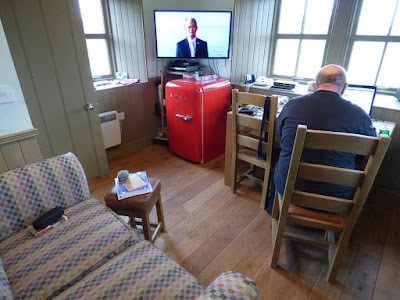 Nice large television with an incredibly sharp picture (all the better to watch my beloved British TV), a way-too-cute bright red refrigerator, a table for two, a chocolate cake to welcome us when we arrived... and an incredible view from those windows. I was in heaven. 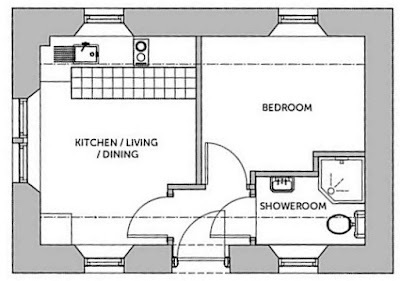 Have you ever noticed that the smaller a room is the more difficult it can be to get it all in one shot? That's what happened here. This shot shows the kitchen. All the basics you need as well as a washer. 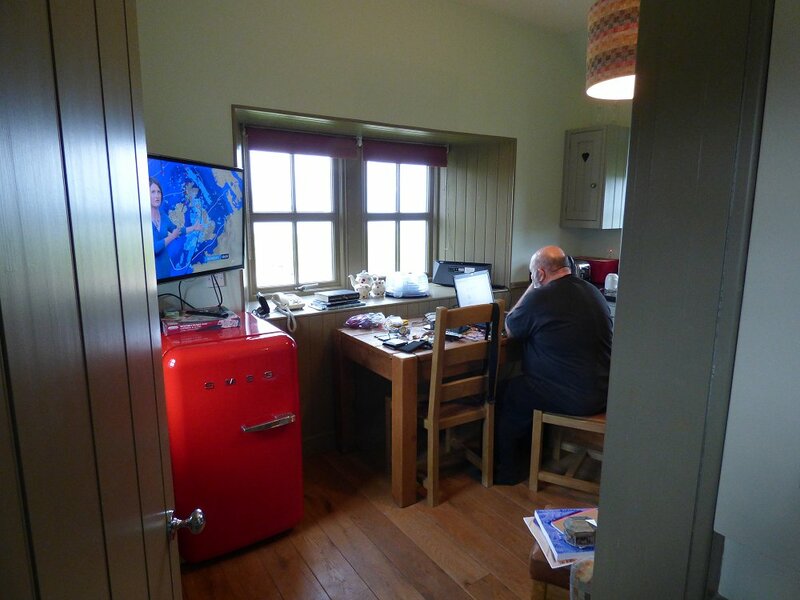 After a week of rain, I have to admit that the bothy really needs a combination washer/dryer! Well-- now you've seen our base of operations, and we've (finally) had a good night's sleep. 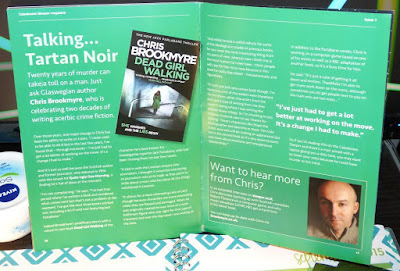 Soon you'll be able to read the next chapter of our UK adventures! Oh, I am looking forward to your chronicle, Cathy! I know just precisely what you mean about air travel, and I don't blame you one bit for spending the extra money for better seats. As far as TSA goes? I've got plenty of 'war stories' about those people; but as you say, it is possible to be polite and treat people with dignity - and still do your job. It's a shame not enough of those folks know how to do that. I really enjoyed your story of the train journey. I've taken trains several times, but never a sleeper. I must, must do that sometime. That cottage is beautiful, and it's in such a lovely place. I can understand why you feel about it as you do. 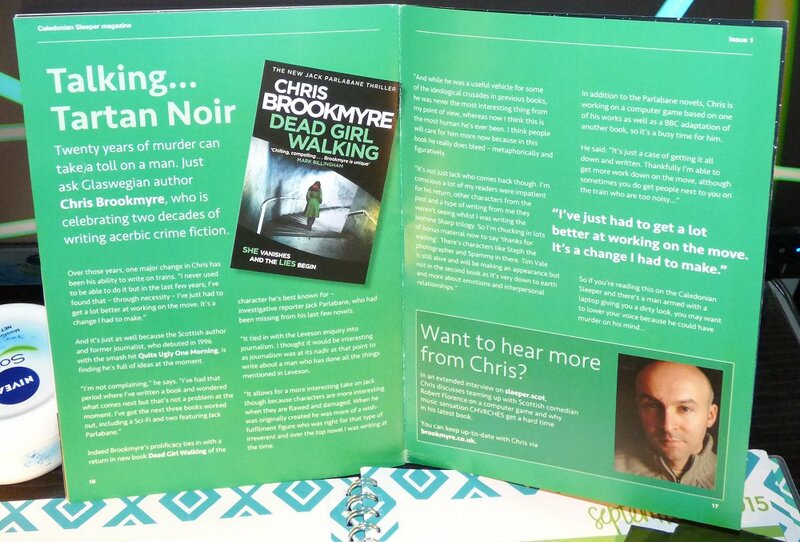 Looking forward to the next instalment! Denis and I thought the upgrade was essential for a ten-hour flight. I think we were right! Flying and airports are a pain these days but it's worth it once you get there. That cottage looks delightful! It was-- except for trying to get laundered clothing dry in constant rain! My boyfriend and I are going to Japan in May, and I'm already dreading the flight, though Al Nippon is supposed to be a great airline. One of those situations where you grit your teeth and carry on. Truly a time when you feel that a complaint-- no matter how justified-- can get you thrown off the plane or out of the airport. It's a disgrace. I have been to the UK and hated the plane trip, but loved my visit. What a nice post. Loved seeing all of this. I love where you stayed. Sorry you had such a bad experience at the airports. If you were in Heathrow, I can totally understand. That place is NUTS. Heathrow is nuts, but everything was bearable for us on the way back to the US until one of the people doing the screening went on break without telling anyone, leaving many of us stuck waiting for our bags. Those who filled in for her took their frustrations out on us. Methinks they should have saved their venom for their disappearing comrade! I love how Denis completely ignored the photo-taking. The Bothy looks snug and well equipped. I can't imagine driving a hundred miles after two nights of little or no sleep. It would have felt nightmarish. Your descriptions of airline travel makes me glad I have never felt compelled to fly anywhere. Ugh. I left out most of the airline nightmares, Pepper. After this trip, Denis and I have decided to "see the USA in our Chevrolet." Er... make that a Jeep... for a while! I can't blame you. And there are many places in the US that are well worth the trip to see. I'd like to (1) show Denis many parts of the country I know he'd love to see, and (2) see some of the spots I've missed in my own travels. Oh my, you did have a journey. We're not rich, but my husband spends months studying airline pricing and generally finds us a great price on First class, that's the only way I can stand to make long trips. Your cottage looks tiny and sweet. Less to keep clean. The next chapter will be out next week, barring the unforeseen! Well, what a bundle of contradictions is international travel. Sorry you had such a hassle at the airports but that cottage and the view seem to be the gold at the end of the tunnel. The towns and countryside are wonderful. Reading about Heathrow just caused me to remember that my typewriter in a hard case (remember them?) was destroyed at Heathrow. My then-partner had taken it with him for an international trip as a journalist. The other memory just dredged up is that of my family traveling overnight on trips from Chicago to New York and back and sleeping in berths. That was so long ago. These stories make me glad that I'm an armchair traveler, no costs, TSA agents, long lines, exhausting trudges, etc. And i can enjoy other people's stories and photos.. I'm fortunate in that I can easily shove the "getting there" and the "getting home" parts to the back of my mind so that I can concentrate on enjoying the "being there" part. That's a good way to remember trip, the good parts. Very enjoyable post, but I can't believe how small the bothy is. I would love to go to the US (I live in Scotland) but the thought of the flight there has put me off for years. I've never flown from Phoenix to Glasgow or Edinburgh; there's no such flight. 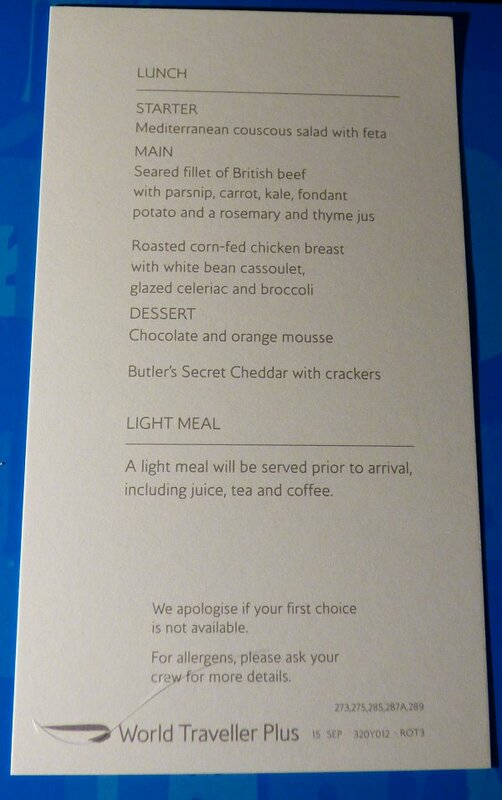 But we have a direct flight from Phoenix to London which takes ten hours. I have to admit that that's about my limit. 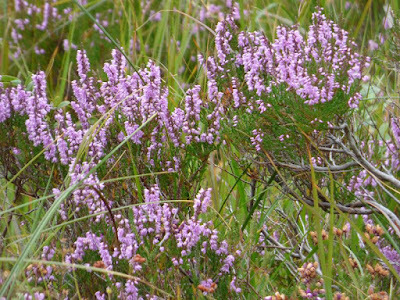 But I'm oh-so-thankful that my limit has allowed me to go to Scotland. I love your country with a passion. I meant to say to you that there's a thing called Tunnelbear which is slightly dodgy I think, but they sell for a small amount of money - a code to enable you to see UK television, if you really want to see it in the US. You should contact Peggy of Peggy Ann's Post as she knows more about it. Denis had something like that for awhile, but we stopped using it because he had to have his laptop connected to the TV. Rather inconvenient. This is still worth looking into. Thanks!